I want to introduce you to a friend of mine. I met Kelli soon after I started blogging. I read about her story because of a fund raising project that was posted in her honor. Kelli has been suffering from end stage renal failure. She had one kidney removed in 1991, and then in 2006, the other one failed to 13%. Since her sweet husband is not a match, her children are not yet 18, and she has no siblings, Kelli has to find a kidney from a living donor. Because of complications, the chances of a cadaver kidney working are not good. I began reading Kelli’s blog, Living in Grace, soon after hearing about her story. And she began reading mine. As a last resort. Because HELLO DIALYSIS? Boring. 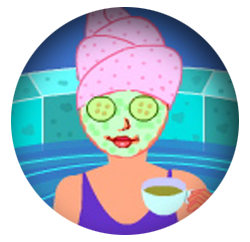 Lots of down time. We realized that we had some things in common, and very likely had passed each other in life while both living in Los Angeles. I learned that her husband, John, grew up in the church where Fiddledaddy and I got married. And I attended the church where she grew up. In fact, her parents were invited to a wedding that Fiddledaddy served as a groomsmen. In other words, we knew a lot of the same peeps. The thing that I appreciate most about Kelli, is her ability to laugh in the face of disaster. While holding fast to her strong faith in Jesus. She has a way of presenting the silver lining of the darkest of clouds. And she always makes me giggle. She has a wickedly warped sense of humor. In fact, she inspired one of my favorite blogging moments. And even though Kelli delights in torturing me with articles, pictures, and stories that serve only to feed my intense fear of amphibians, I want to aid in the search for a kidney for my friend. So that she can continue to torment me. The following is the pertinent information that Kelli gave with regard to how to become a living organ donor. I’m going to cut and paste so that I have all the information and links correct. Thank you for offering to be a part of the call for living kidney donors, and to help with our fundraising efforts. It is a true blessing for this family, and we love you all. Here is the basic info on being a living kidney donor and the process. Feel free to put in out in whatever way you see fit, letting me know if you need further info or anything. 1) I will be listed with OHSU in Portland, OR. If someone is interested, they should contact us at jkbach@comcast.net and we will get them the contact info they need. 2) Because of some complications, I will most likely not be able to use a cadaver donor, although I have been listed with another hospital on the UNOS list for 3 years. 3) I will need donor with the A or O blood type. If you don’t know your blood type, they will have you get tested. 4) All medical costs are billed directly back to OHSU where my insurance covers 100% of all incurred costs. This allows the donor candidate to have all testing up to the end done at their local hospital or Dr. office at on charge to them. 5) Pre-screening involves an over the phone health questionnaire, then a simple blood test where my blood and theirs are combined and cross-matched. If that is ok, then they will have a series of tests done locally to them and billed directly to my insurance. 6) All this will lead up to a scheduled date for everyone to meet in Portland for transplant. The process, from the time a suitable candidate is found, is about 3 months to the actual surgery. 7) Fundraising is currently under way for all costs not covered by insurance (all non-medical). This includes things like travel and lodging for the donor, my housing and support for the month or more I am required to stay in Portland after surgery, etc. We are going to be using giveitforward.org for the fundraising efforts. The fundraiser is located here. I dearly love Kelli. To say that she is an inspiration is an understatement. Please help me to pass along this important information. 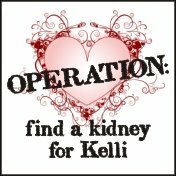 Let’s find a kidney for Kelli. I have type A blood. However I was born with just one kidney. It breaks my heart that I cannot help and so badly want to help. I’ve stumbled this post and will be reposting on my Facebook and other sites – hopefully a donor can be from Canada as well, and not just the US?? How long is the recovery process for the person that donates the kidney? She is definitely an inspiration!